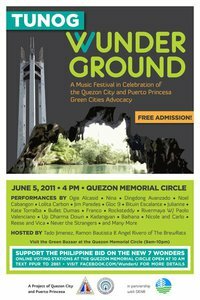 A star-studded music festival promoting the Philippines Finalist in the New7Wonders of Nature, Puerto Princesa Underground River (PPUR), will take place on Sunday in Quezon City, one of the municipalities that make up Metro Manila. The Tunog Wunderground festival will feature performances by Noel Cabangon, Ogie Alcasid, Nina, @jimparedes, Dingdong Avanzado, Gloc 9, Franco, Up Dharma Down and Rocksteddy. Candidates of Miss Philippines Earth 2011, which takes place on Sunday as well, are also part of the drive to support PPUR.